“The question of “What should I do at a conference” might be answered with a question, “What kind of researcher do I want to be”? …Once students understand the kinds of values they hold as researchers, they can think with greater clarity about how to enact themselves as researchers at conferences” – James Burford, Conference Inference Blog. Every year, La Trobe University’s School of Humanities and Social Sciences (HUSS) runs a two-day interdisciplinary conference at which Masters and PhD students present their research to their peers and to academic staff. For many early-stage postgraduate students, this is their first experience of participating in an academic conference. Some approach their first solo performance in a state of high nervousness but, once it is done, most can relax into spectatorhood and many leave with positive memories. In this post I reflect on my experience of being on the organising team for the HUSS HDR 2018 Conference. Jamie (from the RED team) has already posed some thought-provoking questions at La Trobe conference preparation workshops that I have attended in the past. He addresses the practical what-do-I-do questions but also invites us to be thoughtful about another important question: “What kind of researcher do I want to be?” The ensuing questions of how action might contribute to being and how being is enacted can be hard to disentangle but engaging with them shifts attention to what goes on outside the solo performer’s spotlight. What kind of researcher do we, students, want to be to whom, and how might we achieve it? At conferences, we might take the opportunity to confer: to share new knowledge, consult each other, discuss and debate. 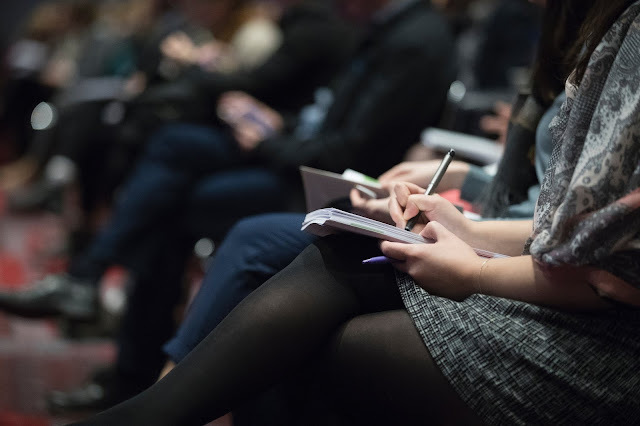 Within the confines of a conference panel, it takes informed presenters, an observant chair and an engaged audience to perform all the ethical, intersubjective practices of conferring, while keeping to a strict timetable. Even when immersed in the heady mix of pre-performance nerves and post-presentation calm/relief/euphoria, student participants appreciate that a conference needs more than presenters, chairs and audiences. It needs people working behind the scenes to make it all happen: reading and theming abstracts, devising the schedule, securing guest speakers, sorting out the catering, organising the publicity… the list goes on. To provide hands-on organisational experience, HUSS invites its postgraduate researchers to participate in these crucial activities. Last year and the year before, I joined other postgraduates and several hardworking staff members on the HUSS conference organising committee. The committee comes together three months before the conference to nominate important dates and deadlines, allocate individual and shared tasks, and send out the call for abstracts. This work takes time away from study and social life; sometimes it’s merely inconvenient, sometimes stressful and exhausting, but always productive. The search for suitable guest speakers on a tight budget, with ever-tightening deadlines, tested our nerves but culminated, nevertheless, in a fascinating keynote by Kim Mahood and a frank, engaging panel discussion on ‘Life beyond the PhD’. Last-minute rescheduling for additions and dropouts, anyone? Late nights at the computer and urgent flurries of communication paid off; every participant, like a piece in a puzzle, completed the whole that was greater than the sum of the parts. In the wake of 2018, I consider another of Jamie’s questions: “How did the experience of conference organisation change the way I see myself as a researcher?” For me, again, it’s about context and how the experience of conference organisation changed the way I see myself within my research community. There’s no doubt that presenting, chairing and conferring at conferences, within and outside the university, has influenced the reflexive process (see also Conference Inference posts by Barbara Grant, James Burford and Lilia Mantai). Warnings abound about how isolating the PhD process can be, especially when the research isn’t done in a shared laboratory and isn’t part of a larger project. Conference participation dragged my research (and me) into a much more public place, changing the way I recognise and locate myself within a broader research community, and changing the way that community sees me. At least, it sees me, where perhaps it didn’t before. Participating in the HUSS conference organisation has had additional effects. Now, post-organising, my research community encompasses my fellow organisers: an interdisciplinary group whose main commonality lay, in the beginning, in the practical tasks at hand. Over time, we learned about each others’ work, found friends and acquaintances in common, and discovered surprising connections between our research projects. At the same time, reading and grouping conference abstracts, which emerged from multiple departments and disciplines, revealed equally fascinating thematic connections between projects and people that might never have come together otherwise. It was satisfying to bring people together to discuss gender representation in literary fiction, film-making and political handcraft movements, or the displacement of marginalised communities after natural disaster or civil war. There was real joy in bringing together a historian-entomologist with an interest in poetry, a political historian and two political musicologists to talk about Song, Poetry and Social Responsibility. And, because most of the committee members also presented their own work at the conference, they experienced this remarkable, interdisciplinary cross-fertilisation process first-hand (see also Mark Dunford’s post on Unconferencing). The experience of conference organisation made a difference to the way I see my research community – bigger, more complex and with much more potential for interdisciplinary collaboration – and my position within it. I hope I might be a more resourceful, useful colleague because of the skills and connections I gained along the way. More uplifting though, is knowing how to connect with and bring together other researchers within or across a range of disciplines, and knowing that those connections can be enriching for everyone. So, if you get a chance and you can spare the time, give conference organisation a try. It can be hard work but the rewards are there. Karen Strojek is a PhD student in the Department of Politics and Philosophy at La Trobe University. 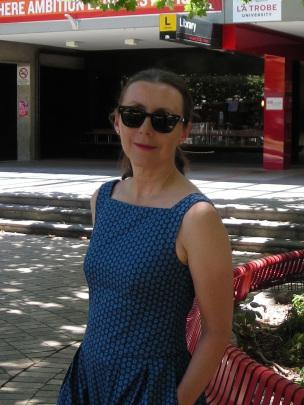 Her doctoral research is on the history of political activism surrounding the taxation of inherited wealth in Australia, with a particular focus on gendered patterns of property ownership, rural and urban land policy, and Australian federalism. Karen completed a Bachelor of Arts, with majors in Sociology and Politics, at Griffith University in 2014 and Honours in Politics at La Trobe University in 2015. She has extensive experience in the clothing and textile trades and ran a bespoke clothing company from 1999 to 2013. Karen has also tutored in industrial methods in the Fashion Design school at RMIT.